Colored engagement rings are enjoying a real renaissance right now, especially among Millennials. There is no longer any need to stick to tradition when it comes to almost anything related to a wedding and younger couples are embracing that fact. These days it’s as common to get married on a beach or in a barn as it is to make the traditional trip to a church, and bridal fashions have gone way beyond the once ‘mandatory’ puffy meringue of a white dress. It’s only natural then that engagement rings – the very things that mark the beginning of the wedding ‘process’ should follow suit and more and more brides should look to colored engagement rings in order to have something that is best suited to their personal style and jewelry aesthetic. However, what if you have shopped and shopped and still really found nothing that matches your vision. Maybe you’ve seen colored engagement rings that were almost right but something just didn’t quite match your vision; the cut, the setting, the particular shade of the center stone. Before you settle, it might interest you to learn that there is another option; designing your own colored engagement ring. 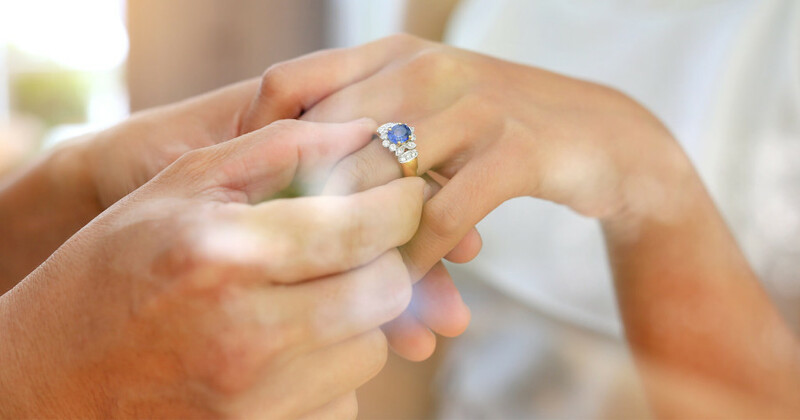 While the average person might not know that much about the technicalities behind all of the elements that make up the average engagement ring – how it’s cut, how it’s set etc. – they do usually know what they like in terms of design. They can usually envision it in their mind’s eye, sketch it out even. They just lack the ability to bring their imagined creations to life. That’s where a custom designed colored engagement ring comes in. There are now diamond houses who employ a staff of talented designers who can take any of the elements that are on offer – primary stones, secondary stones, settings, cuts, sizes and of course colors – and work with clients until their vision – and the perfect for them colored engagement ring – becomes a reality. Why Design Your Own Ring? What’s usually the first thing someone does when they get that longed for engagement ring? They show it off to the world of course. And for many, the more unique and special it is – as well as different from their peers – the better. There’s little danger of a ring being the same as anyone else’s if you design it yourself is there? These days everything about a wedding is something that most couple’s carefully plan to be as true to them – and their relationship – as possible. From the venue (as we mentioned almost anywhere goes) to the members of the wedding party, the dress, the suit, the food, the decor and so much more the modern wedding is often all about individuality, and if you design your own colored engagement ring that ‘vibe’ is present from the start! Designing your own ring also allows you to mix and match to your heart’s content. One of the great beauties of the colored diamond engagement ring is that you don’t have to follow any set rules. A pink diamond center stone surrounded by yellow diamond accents? Why not? A deep blue diamond heart shaped center stone accented by more traditional white diamond accents? A rose gold setting – which is very much on trend right now – instead of the more common white gold? All possible. In fact work with the right ring designer – and diamond house – and you are really only limited by your imagination.